“Jasper” is a 15 year old Quarter Horse gelding. Jasper presented with pain related to a chronic left front carpal injury. Previous evaluation of the carpus reveled a chip fragment, which was surgically removed, as well as extensive bony remodeling. At presentation, the carpus was found to have severely decreased range of motion. Additionally, myofascial pain and dysfunction was identified in the cervical region, epaxial muscles, and left shoulder/forearm. While the range of motion in the joint remained decreased, the myofascial dysfunction responded well to treatment with acupuncture and e-stim, and Jasper’s comfort level improved noticeably over the course of treatment. “Jasper,” a 15 year old AQHA gelding, has a history of left front carpal injury that was first discovered about 5 years ago. At the time of the initial injury, Jasper presented with acute, fluctuant swelling in the area of the left front carpus. At that time, Jasper was sound, and after a brief period of rest, he continued in work. 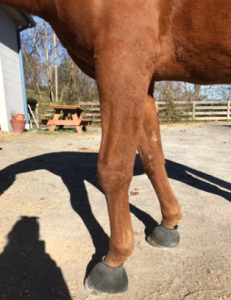 The swelling in this region never abated, and at the time Jasper’s veterinarians believed this to be a carpal hygroma and gave him a good prognosis for soundness. After continuing in work for 1-2 years, Jasper became mildly lame on the left front. Radiographs revealed a chip fragment, as well as significant bony remodeling, including intraarticular osteophytes and entheseophytes in the area of the attachment of the extensor carpi radialis. Jasper underwent arthroscopy, during which an osseous fragment was removed from the extensor carpi radialis tendon. After recovering from the procedure, Jasper was able to maintain light work for an additional 1-2 years. At this point, Jasper has been retired from riding and the owner’s goal is pasture soundness. 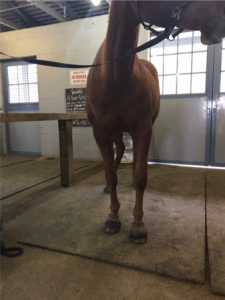 Jasper’s current treatment program includes intraarticular injections with ProStride® every 8 months, daily firocoxib (57 mg), and daily supplementation with a joint supplement containing resveratrol and hyaluronic acid. Jasper wears a Back on Track® magnetic wrap on his carpus while stalled. In the past, he also has been treated with bisphosphantes. He has also received chiropractic and acupuncture treatment in the past. Jasper has no other significant medical or lameness history. At presentation, Jasper was bright, alert, and interested in human interaction. He appeared overall healthy, with a BCS of 6/9 and shiny coat. Brief physical exam revealed no abnormalities with the exception of the musculoskeletal abnormalities associated with the left carpus. The left carpus was significantly enlarged, particularly laterally and dorsally. The swelling was firm and non-fluctuant and continued proximally along the forearm. There was no discernable heat in the joint, and it did not seem painful to palpation. The range of motion of the carpus was severely reduced – at maximum flexion, the carpal angle was approximately 120 with a firm end feel. Jasper resisted attempts at increased flexion, indicating pain. The left pectoral muscles were extremely atrophied. While standing, Jasper consistently placed the left forelimb abducted at the elbow and displaced cranially. 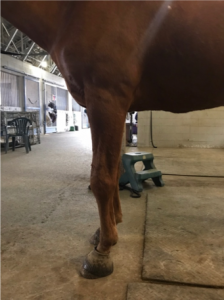 The limb never fully extended, instead remaining slightly flexed at the carpus (see pictures below), thus resulting in a failure of the limb to completely engage the suspensory apparatus for weight support. The right front was consistently placed abnormally far caudally to support his weight. At a walk, Jasper continued to abduct the limb from the elbow, resulting in a winging out gait. The amount of flexion and extension of the carpus was very limited at the walk. Myofascial exam was performed. Multiple taut bands were identified in the brachiocephalicus muscle on the left side of the neck at the level of C4-C7. Neck flexion was within normal limits to the left, but Jasper resisted flexion to the right when asked for flexion of the caudal neck. The left infraspinatus and supraspinatus were ropy and small trigger points were palpated in both muscles at the mid-body level. The long and lateral heads of the triceps brachii were both extremely tight with numerous tight bands, and large trigger points were identified in the body of each head. The extensors of the carpus were firm and hypertrophied. Jasper also exhibited extreme sensitivity over the epaxial musculature on both the left and right sides. Significant pain was elicited on palpation of the junction of the transversospinalis and longissimus muscle systems from the cranial thoracic area to approximately the level of L3 on both sides. 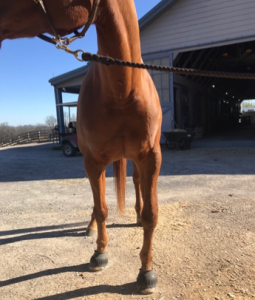 Jasper had a normal response to the lumbosacral pull, SI slide test, hindlimb circling, and motion palpation of the spine. Myofascial exam of the hindquarters revealed no significant abnormalities. There are two main targets in this case – the carpus and the secondary myofascial dysfunction. While the carpus has chronic damage that is unlikely to resolve, treatment can be aimed at relieving pain associated with this injury. Myofascial treatment should address the myofascial pain as well as aim to increase range of motion in the affected carpus, as it is likely that myofascial tension is contributing to the extremely decreased range of motion. The tautness and trigger points in the triceps muscle are likely to overexertion of the muscle as it attempts to fully extend the elbow, working against the dysfunctional carpus, which is keeping the leg in a flexed position. Likewise, the carpal extensors are chronically working in an attempt to extend the dysfunctional carpus. Based on the dysfunction of the triceps and carpal extensors, the radial nerve is an important target for treatment in this case. The superficial pectoral muscles are responsible for adduction of the limb, and the atrophy is likely related to the chronic abduction of the limb. In this case, the primary cause could be neurogenic atrophy with secondary failure of adduction and thus chronic abduction of the limb. However, based on the near complete immobility of the carpus, it seems more likely that the limb abducts chronically because the carpus cannot extend or flex enough to walk with a normal gait pattern. 2. Primary spinal pathology – i.e. kissing spines, osteoarthritis of the facets, etc. Based on Jasper’s history and previous radiographs, it is known that he has extensive osteoarthritis of the left front carpus, as well as extensor carpi radialis tendinopathy. These pathologies are chronic and unlikely to resolve. Jasper also has significant myofascial dysfunction that very likely developed secondary to protection of the left front carpal injury. Jasper showed a favorable response to treatment, including demonstrating signs of relaxation and endorphin release, such as licking, chewing, and yawning. After each session was over, the triceps, infraspinatus, and supraspinatus muscles were softer and less tender to palpation. At the third session, Jasper appeared much more comfortable. His stance and posture were much more normal, with the left front leg bearing more weight and the knee extended to a straighter position than was observed at the first evaluation. He placed his front limbs evenly instead of displacing the left fore cranially and the right fore caudally. The abduction of the limb was also noticeably decreased from the time of presentation. The tight bands in the neck and shoulder were improved and he exhibited much less sensitivity on palpation of the epaxial muscles. All of the previously identified trigger points were resolved. The extensor muscles of the antebrachium were soft and relaxed on palpation. The left pectoral muscles were approximately 50% less atrophied than at presentation. While range of motion remained severely decreased, overall comfort and function of the limb was dramatically improved. The improvement was likely due to a combination of the acupuncture and the overall excellent care and management that Jasper receives. I believe this case would have been a good candidate for laser treatment, but unfortunately I do not have access to that modality at this time. I believe LLLT targeting the carpus and extensor tendons would have improved the range of motion and complemented the pain control achieved with acupuncture and NSAIDs. This case demonstrated how acupuncture can be used successfully in conjunction with Western medical techniques. Jasper has received an excellent standard of care throughout the course of his injury, and acupuncture treatment offered a modality to further increase his comfort, particularly by addressing the myofascial dysfunction that he developed secondary to his injury.